The O2OA intervention mapping tool developed by Julie Bayley (2015) from the work of Bartholomew et.al. (2011), has been used by the O2OA project partners. The tool is applied as a means of encouraging open access compliance, and helps to determine (or ascertain) why people act in certain ways. Information gained through application of the tool is used to help identify strategies and actions that can encourage changes in attitudes and behaviours. 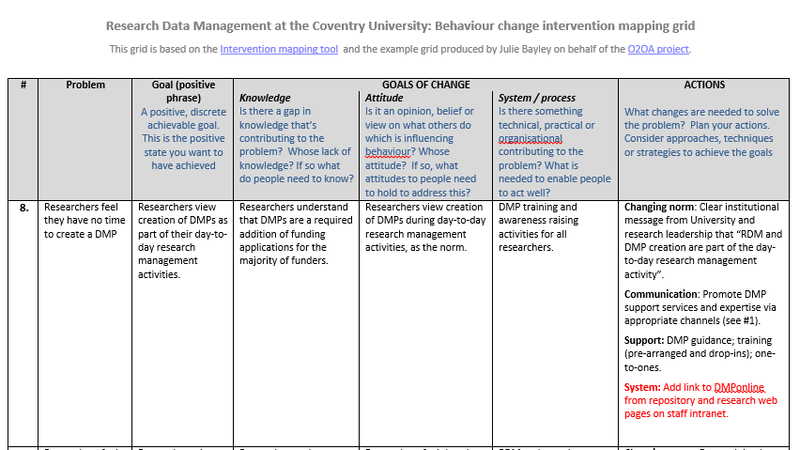 At Coventry University we have also applied this mapping tool to the Research Data Management (RDM) agenda, particularly in seeking to understand how we can best develop support services to assist researchers in engaging and complying with funder requirements for RDM and open data. As with OA, increasing our understanding of how people approach RDM and why people vary in their behaviour has helped us to develop a stronger institutional approach regarding RDM support. An institutional audit of both researchers and professional services staff, using questionnaires and interviews, helped to identify issues, concerns, and discipline differences that influenced behaviours and hindered engagement and compliance. Completing the mapping tool has gone further to help develop practical goals, actions and strategies that can more positively influence behaviours. Going through each issue separately has allowed us to consider what actions are need to enable change, defining where appropriate the changing norm that will support the process of change together with the underlying strategies (systems, communication, support) required to deliver and influence change. Figure 1 highlights an example of a RDM problem perceived at CU, and the actions suggested to overcome and influence behaviour change. The use of this mapping tool has helped to identify a number of intervention techniques and advocacy mechanisms and services that will help to enable researchers to alter their day-to-day activities to incorporate RDM as the norm. It has encouraged an holistic approach which we feel will support and assist researchers and research support staff to understand and meet RDM requirements. Bartholomew, L.K., Parcel, G.S., Kok, G., & Gottlieb, N.H. (2011) Planning health promotion programs: an intervention mapping approach. San Francisco, California: Jossey-Bass.